Paul – a “sound” name that would be difficult to shorten; Stedman – Janet (his Mother) and I met in a belfry; George – Paul’s maternal and paternal grandfathers were both called George. Although Paul was not a “famous” ringer, little known outside his home area or in connection with his work, he would make up a band when required – especially for Sunday ringing, weddings, etc. His birth was welcomed by the first peal on the ring of five bells at Thurnham R.C. Church, Lancashire (conducted by Revd Kevin M. Price), and I taught Paul to handle a bell some 20 years ago at Husbands Bosworth. He was not an ambitious ringer, but a very competent tenor-behind ringer, having covered to some seven quarter-peals at Husbands Bosworth – including the first since augmentation to 6 in 2006. Almost prophetically, his last quarter was a half-muffled one for All Souls’ Day this year (see the report appended to this obituary). His final ring turned out to be the ringing on Remembrance Sunday at Husbands Bosworth, after which he joined the parade. We had intended to attempt our usual half-muffled quarter-peal on Remembrance Day evening, but neither my wife nor myself felt that we would be able to concentrate (let alone I conduct it), so the attempt was cancelled. However, Husbands Bosworth bells were rung half-muffled the next day for the regular Thursday evening practice. How can we begin to describe Paul? Such characteristics as modest; caring; considerate; generous; willing; reliable; intelligent; meticulous; a very skilled engineer, sensitive to conservation and restoration issues, and always working to a very high standard; a great love and respect for historic objects – even his parents and in-laws(! ); a quiet, but pointed and mischievous, sense of humour all come to mind. You might think that as his father, I would say that – but these are words also used again and again by other people about Paul. If Paul saw that something needed to be done – such as a repair – he would just get on and do the job. From a very early age, Paul was interested in things mechanical: we always said that he was born with a spanner in his hand! He began to try to help me at least from the age of six, and was of great assistance during his school holidays as a teenager. 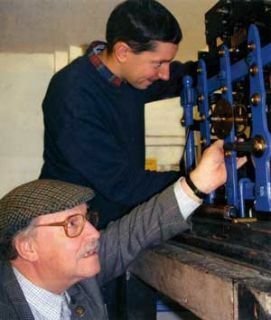 On leaving school in 1998, he formally began work for G. D. Armitage (Clock & Belfry Work) Limited, specialising in turret clock restoration, conservation and installation, as well as bellhanging work. Paul was able to use his ringing ability in our work with tower clocks and bellhanging – especially to check that bell wheels, stays and hammers all cleared and worked correctly, and to check the handling of a bell after we had carried out work on it. He was a very hard worker, and always prepared to learn, including the gaining – after a lot of hard graft, on a day-release basis over 5 years – of a 2.1 Honours degree in Engineering, and professional Membership of the Britsh Horological Institute. I had come to leave much of the practical work to him, while I did my best with the bureaucracy. Having worked on tower clocks and bells from the West of Ireland to Berlin, his rôle had developed to such a level of competence that we would have been content to leave the business in his most capable hands. Paul worked to a very high standard, machining everything from bearing sleeves to manufacturing our own automatic winding units, plus dial gilding, et c. In fact, plans were well under way for Paul to carry on the business, and for me to take even more of a back seat. Paul and Anne were married on 25th April 2009 at St Nicholas’s Church, Marston Trussell (near Market Harborough), which is also where Paul’s funeral/memorial service took place, after a committal service at Kettering Crematorium earlier that morning. His ashes are interred at Marston Trussell. Many bellringers were in attendance, and the bells were rung by members of the Peterborough and Leicester Diocesan Guilds – as well as some from further afield. The ringing immediately beforethe servicewas by Paul’s Godmother (Mary Burton, Sibbertoft), his Godfather (Neil Skelton, Wilton, Salisbury), his Sister (Helen) and his Mum and Dad. The goodly number of bellringers present organised the half-muffled ringing after the Service, ending most appropriately with a well-struck 120 of Stedman Doubles. Paul’s wife is a nurse and was working late on the evening of 10th November, and would not be home until about 9pm, having eaten at the hospital. On such occasions, Paul would eat an evening meal with my wife and myself (on the same site as our workshops). Within about ten minutes after leaving us to drive to the marital home in a village about 7 miles from us, Paul (who was always a careful, considerate and reliable driver) was killed in a traffic collision. [From as much as the Police have told us so far (there will need to be an Inquest – and possibly a Court case – which could take 9 to 12 months! ), it seems that Paul was driving on his correct side of the road, at a sensible speed, approaching a bend]. He was such a steady and considerate driver that he would usually drive, while I sat working through paperwork, and I had no worries – which is why this situation is so exceptionally poignant. In an age when things that need some care and attention, and there is a temptation to throw them out and replace them with something cheaper from China, Paul’s conservation and restoration skills and considerable experience (the next generation …), were all very valuable, but have now been lost in seconds. It is hoped to keep the business going for the short-to-medium term, but the longer term is not so clear. Paul was exactly 29 years and 5 months old, and leaves his widow, Anne, after only 6½ months of marriage. On behalf of Paul’s extended family, our heartfelt thanks go to all who have tried to help us through this exceptionally difficult time. We have been surprised, overwhelmed and humbled by the condolences, the caring support, love and prayers that have been received from so many people from so many parts of the world, but even more so by the wonderful and positive comments about Paul. It seems that he – and those he leaves behind – are being prayed for on at least four continents and across all denominations – from the humblest chapel to great Anglican and Roman Catholic Cathedrals. On the Sunday after Paul’s funeral, the Armitage family was greatly supported by invited attendance at a Memorial Mass at St Mary’s R.C. Chapel in Husbands Bosworth. [Paul had often joined us to ring the Anglican bells for special services, such as weddings, at the R.C. Chapel, as well as for the regular 8.30 Mass on Christmas and Easter mornings]. We understand that carillonneurs in several countries have played recitals with music in honour of Paul – including on such well known instruments as that of Bruges in Belgium. It is a massive tribute to Paul, and we have been honoured that so many people have attended Marston Trussell Church (it is doubtful if so many (about 200) have been packed into this small building since anyone can remember! ), even from as far afield as The Netherlands and Ireland (both the Republic and the North – so as not to show favouritism)! It is hoped to install in this same Church a bell inscribed in Paul’s memory, to augment the existing ring of 5 to 6. I knew Paul only a little. Sometimes such a face-to-face impression allows us to catch the most essential points of personality, the spirit of somebody. In my mind – I am really completely serious – Paul was a saint. He had a crystal-clear character and natural gentleness in his own way. He was an absolutely transparent person – something that is extremely rare – and he had some kind of inner light that made people feel good in his company, and they felt better themselves. That is my genuine impression. Meeting him for so short a time, just the twinkling of my eye, I caught this indescribable aura surrounding him …” Paul had a short but very full life, which touched many people in many walks of life, and he will be remembered as the dearly loved Husband of Anne and beloved brother of Helen. We could not have asked for a better son, and we have been proud and honoured to be his Parents. May he rest in peace and rise in glory.